Why this band has not seen more exposure is completely beyond me. I’m sure there are fans of the band out there, but I have yet to meet one. It amazes me how some bands get record deals and promotion, while Attack isn’t even on the radar screen. If you like Iron Maiden, Gamma Ray, Hammerfall, or ‘Keeper’ era Helloween, this band deserves your attention. I realize those three bands are legends in their own rite. Is Attack really worthy of being compared to those great bands? Absolutely. 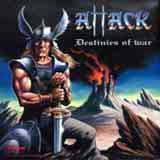 Attack deliver twelve tracks of epic power metal that will remind you of each of the three above mentioned bands at any given time. The vocals feature a delivery similar to “Land of the Free” era Kai Hansen, but with more range and a richer voice. Rick van Helden’s German accent is quite evident on occasion similar to that of Kai. Above all, Rick has a very melodic voice which only compliments the galloping arrangements on this disc. From start to finish, the guitar riffs are fast and very tight. At times, you feel like you are on the battlefield about to charge into the heat of war with the energy the band creates here. Although the riffs are very fast and intricate, they are also quite melodic, which complemented with Rick’s melodic vocal delivery makes for very catchy songs. Oh, Rick also handles bass guitar duties, and does quite a fine job. He is more than able to keep up with the pounding riffs, keeping the overall sound very well balanced on the low end. If you enjoy dual leads and twin guitar solos, you will not be disappointed as the dual axe attack rips and tears all over this disc, very reminiscent of Iron Maiden at times. Don’t skip the instrumental final track of this disc - you will hear some fantastic guitar work. I have not a single complaint regarding the musicianship on this disc. It is top notch. While the band certainly hits the head on the nail with the straight forward power driven songs, I am also very impressed with the tracks that start off slow, build gradually, then totally blow you away. One standout track, Blind Man sees a calm start with an acoustic guitar in the background, then explodes into a furious riff that doesn’t let up. Death Rider literally rings in with a loud ominous crash of a bell, backed with an equally ominous acoustic guitar ala Metallica’s Fade to Black, then the anticipation grows with the pluck of the acoustic bass, which in turn gives way to the fury of the dual guitars! Yes! This is not only one of the standout tracks on this disc, but one of my favorite all time tracks as well. So, if you enjoy a good dose of double bass, dual leads, twin guitar solos, speedy and intricate riffs, and some great melodies, by all means get this disc! Each of the band members are very talented, but more importantly, the chemistry of the band is dead on. The rhythm section keeps the pace moving along to accommodate the ever present speedy riffs, yet stays very melodic. I am blown away each and every time I listen to this CD.